Decide the Fate of Indines! 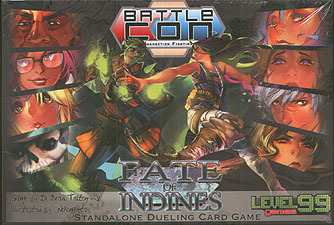 Battle Connection: Fate of Indines is a stand-alone head-to-head duelling game unlike anything to come before. Choose your character from a roster of shapeshifting metamorphs, cursed knights, living shadows, and more! Every character can utilize up to 35 different moves in combat, and each brings a powerful new play mechanic to the table that completely changes the game and forces you to fight in different ways. Use time control, cutting edge technology, and even your own life force as deadly weapons to gain the upper hand. Fate can be played by itself, or combined with other BattleCON Games. It is designed for both new players and veterans!